So why have two different tools for two simple jobs? Well we offer the solution with one tool for two jobs. Simple, Compact, safe and inexpensive! You did notice we used inexpensive not cheap! This is a quality tool with nice thick plastic so it will not get brittle and crack apart after one season of use. Also the bright red color will help you find it after you lay it down somewhere. This tool is great! When not in use it springs closed automatically so it is safe to keep in your pocket and when you go to pull it out any sharp edges are covered. Perfectly safe! 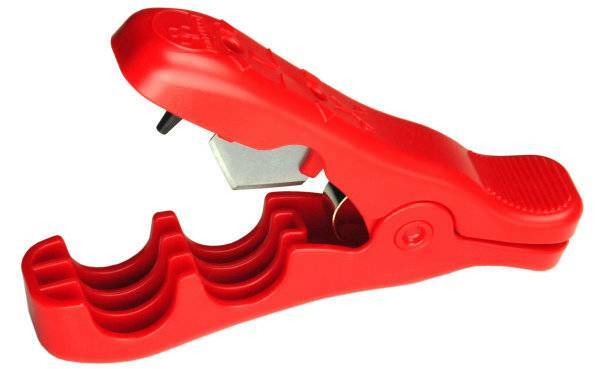 The cutter and punch are separated so no cutting when trying to punch a hole. Give it a try and review it so everyone will know if it's worth it. This is a drip tubing cutter and punch that works like a staple gun. Place the drip tubing below the cutter and press, to make a clean cut. 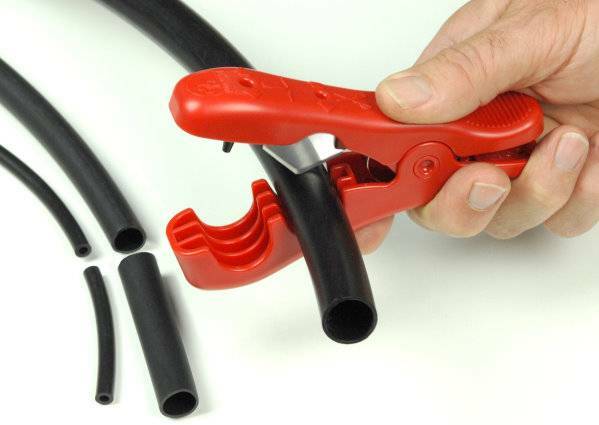 This tool can be used to cut vinyl micro tubing or 1/2" polyethylene drip tubing.